Cecilia Fox | Troy Daily News The Miami County Board of Elections voted Tuesday night to fire Director Beverly Kendall, center. 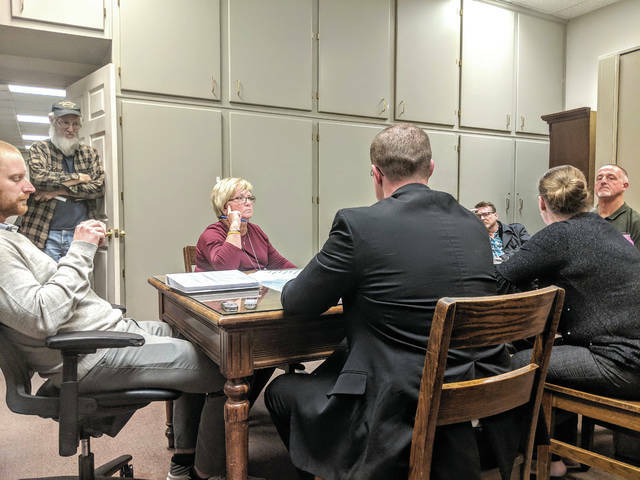 MIAMI COUNTY — The Miami County Board of Elections fired Director Beverly Kendall Tuesday night and said they will move forward with an investigation into the more than 6,200 early votes missing from the November general election results. The board voted 3-1 to terminate Kendall, citing a lack of confidence in her ability to carry out the operations of the Board of Elections. Board member Ryan King voted no, saying he preferred a transition plan. The missing votes, which were cast by early voters at the Board of Elections office, were discovered by the Ohio Secretary of State’s office in December. According to the board, the missing votes did not affect the outcome of any races or issues nor did they require recounts. “Director Kendall is responsible for providing accurate information to the Board of Elections regarding election results and Director Kendall failed to do that on a magnitude of over 6,200 votes,” board member Rob Long said. “It’s regrettable that we’ve come to this place, but I don’t see that there’s any other option,” board member Audrey Gillespie said. The problem occurred on election night when the early votes were not counted in the first round of results. Long said that elections staff and Kendall were asked several times if all the votes were counted and the board was assured that they were. The board said Tuesday that they believed the problem had been corrected on election night. The uncounted votes were discovered by the Secretary of State’s Office and reported on Dec. 20. Fisher was informed on Dec. 21 and the board took steps to determine what happened. A Dominion Voting Systems representative suggested in a phone call with Fisher on Jan. 7 that the error occurred when the machines were incorrectly shut down. A special meeting was called for Jan. 17 to discuss and amend the election results, but the agenda was tabled when King protested the scheduling of the meeting because he was unable to attend. King said he was “very comfortable,” saying that the error was a “simply a mistake” and not intentional election fraud. He said that he was “personally very disappointed” in the service from the board’s equipment vendor, which was paid to provide in-person election night support. A representative of Dominion Voting Systems was present on election night, and according to Fisher, told the board that the counting error had been corrected. The board voted to pursue a full refund of about $4,300 from the vendor. The problem was first discovered by the Secretary of State’s Office and reported on Dec. 20. Fisher was informed on Dec. 21, and the board took steps to determine what happened. A Dominion representative suggested in a phone call with Fisher on Jan. 7, that the error occurred when the machines were incorrectly shut down. The board said they would launch a review or investigation into the series of events that led to the votes being missed, as well as the office’s election day processes. “There’s something wrong here,” Fisher said, adding that the error should have been caught on election night or before the results were certified by the board and sent to the Secretary of State. Fisher said he’s not sure he trusts information from the Board of Elections staff before making a motion to bring in a third-party investigator. “We need fresh eyes on this,” he said. Long suggested a review by the Secretary of State’s Office. Fisher said he received a proposal from the Butler County Board of Elections to assist Miami County in an investigation. A motion to launch a review was tabled until the board receives more information. Gillespie said she agreed with the need for an audit of the board’s processes, adding that the board needs to make sure nothing like this can happen again. The amended results will be uploaded to the board’s website alongside the incorrect results. After several months of discussions, the board also voted Tuesday night to purchase a new voting equipment system, a paper ballot system with scanning equipment from Clear Ballot. https://www.dailycall.com/wp-content/uploads/sites/30/2019/01/web1_IMG_20190122_192857.jpgCecilia Fox | Troy Daily News The Miami County Board of Elections voted Tuesday night to fire Director Beverly Kendall, center.